Today, the One Dollar Currency Note remembers a news article from August 20, 1909 in the Meriden Daily Journal. Considerable opposition is being manifested by the banks of the country to the suggestion of Secretary of the Treasury MacVeagh that the size of the American bank notes should be made smaller. They do not care how ornate the treasury shall make its notes and think it is probably a good idea to have them as artistic as possible. But when it comes to making a change in size, the national banks point out that there are practical objections in the way. In the first place, if the treasury made its notes smaller, every national bank in the country would have to make its notes conform. This would mean that practically all of the national banks of the United States would have to change the plates from which their notes are printed. Each bank that issues notes has at least three of these plates for denominations of $20, $10 and $5, and some have more. The engraving of these plates costs $75 each and the work has to be done at the Bureau of Engraving and Printing in Washington. To change all these plates would not only cost each bank quite a sum of money, but would take a lot of time. Another objection from the practical standpoint is that throughout the country the drawer of the paying teller of a bank is fitted with partitions of the size of the present currency. Of course a smaller bill would go into a larger partition, but it is claimed that great inconvenience would result and that it would be necessary to make over the drawers of every bank so that the partitions would conform to the size of the bills. It took another 20 years before the Bureau of Engraving and Printing began printing currency with smaller dimensions. Their primary objectives with the smaller currency were to reduce their production costs such as the paper, increase their productivity with more notes per sheet and to discourage counterfeiters with complex artistry. They also believed reducing the types of notes from many different designs produced by the national banks to just a few consistent designs produced by the Bureau of Engraving and Printing would help prevent counterfeits. Over time, the national bank notes from the different banks around the country were traded for the federally produced currency and phased out after the last was produced in 1938. Today, the different currency notes from the past can be found as collectors’ items—just another type of numismatics. 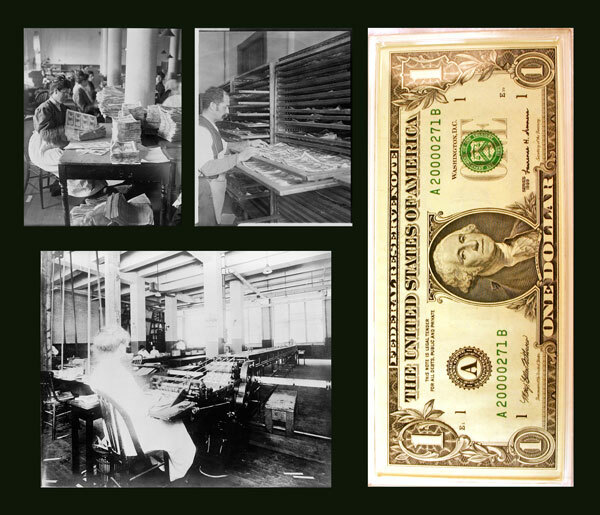 The One Dollar Currency Note shows against images from the Bureau of Engraving and Printing from 1907, 1908 and 1909.